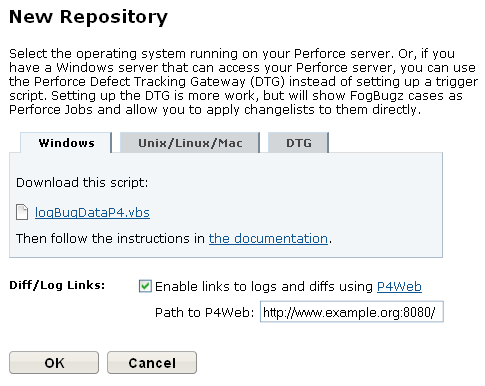 This KB article provides information on how to add a repository using Perforce in Manuscript. Select Perforce as the type. Give the repository a display name. The resulting dialog contains a script for getting Perforce to transmit changes to Manuscript. Select the appropriate tab for the server Perforce runs on to use triggers, or DTG for the Perforce Defect Tracking Gateway (DTG). Download the script and follow the instructions below to set it up. Before you close the dialog, choose whether you want Manuscript to provide links to your check-ins. You can change this setting later by clicking the Edit icon next to the repository on the Avatar Menu > Source Control page.